If asked to picture Christmas, you’ll probably conjure up images of presents under the tree, stockings hung by the chimney with care and huge turkey dinners you let yourself get away with because it’s the diet-free day of December 25th. Maybe you’ll think about walking through your local town or park to take in the displays, or perhaps you’ll remember the last time you decorated your own home for everyone’s favourite time of year? Well, there’s one thing that brings all those festive thoughts together: they are images lit and made special by the enchanting illumination of Christmas lights. 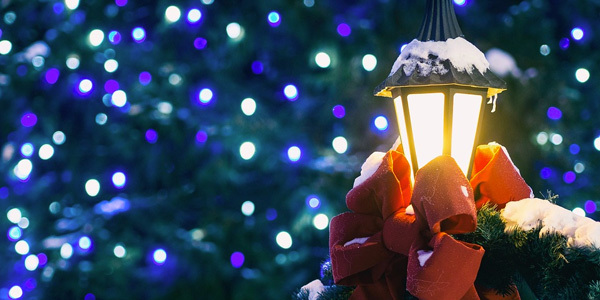 Whether festooning your house with an extravagant display, walking through public shows, or keeping it simple with a string of lights around the tree, they’re an integral part of the season. Well-known displays have even become tourist destinations in their own right. Who hasn’t been to one of these? Oxford Street: Christmas 2017 will see 750,000 LED bulbs come together to cast a magical glow over one of London’s most famous and walked streets. 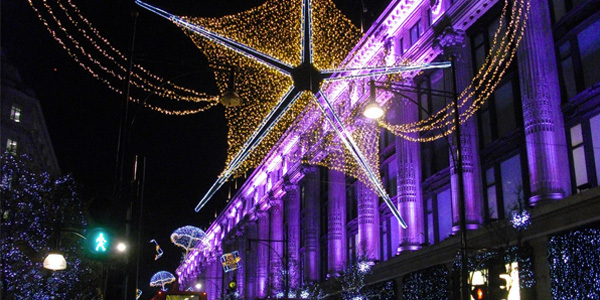 Three miles (the longest shopping street in Europe) plays host to one of the best displays in the world. 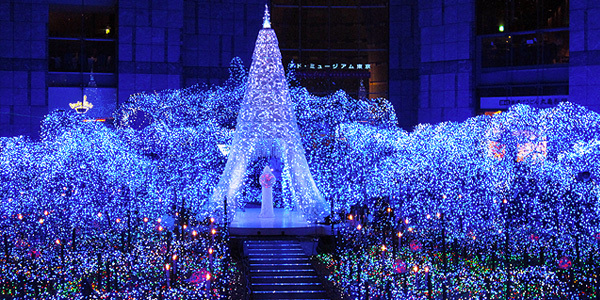 Shiodome Caretta Illumination: Japan might not seem the logical place for Christmas lights, but head to Tokyo’s Caretta Shiodome mall for a truly sensational display. With roughly 250,000 LEDs packed into such a small area, the venue puts on a breath-taking show every 20 minutes across the Christmas season. 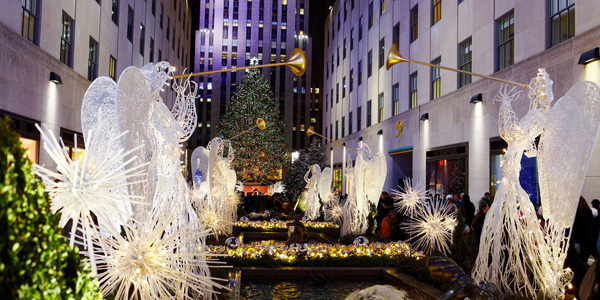 Rockefeller Center: If you’re American, Rockefeller Center is probably synonymous with Christmas. It’s where you’ll find the famously huge Rockefeller Center Christmas Tree, and the turning on of the lights is a star-studded event that gets its very own show. 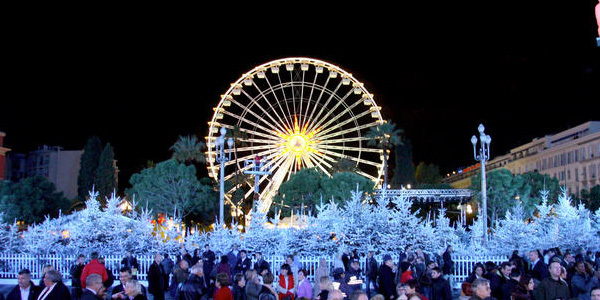 Nice Village de Noël: Head to the French Riviera for Christmas among the palm trees. The famous Promenade Des Anglais is richly decorated with fabulous lights and magnificent Christmas light installations, and the Village de Noël is the centre of the party. 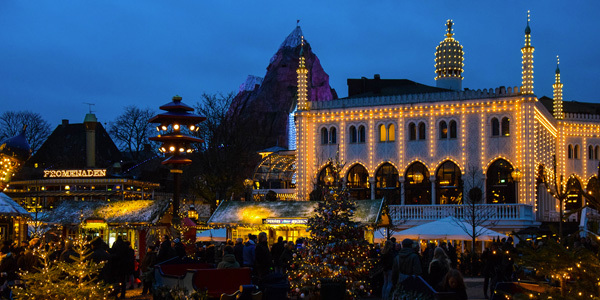 Tivoli Gardens: Set in the middle of Copenhagen, Tivoli Gardens has been a destination for the festive period ever since it opened way back in 1843. 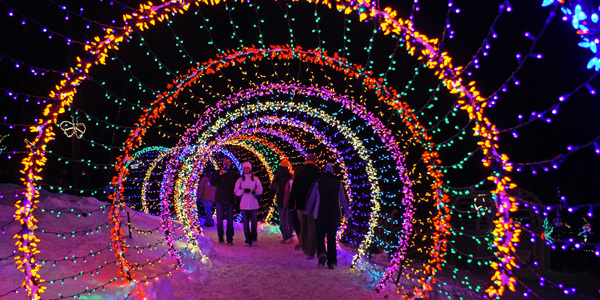 Visit today to take in an extravagant light show that beautifully illuminates Tivoli Lake. Make sure you stick around for the fireworks. Medellin: Another lesser-known and rather unlikely entry is found in one of Colombia’s most infamous cities. 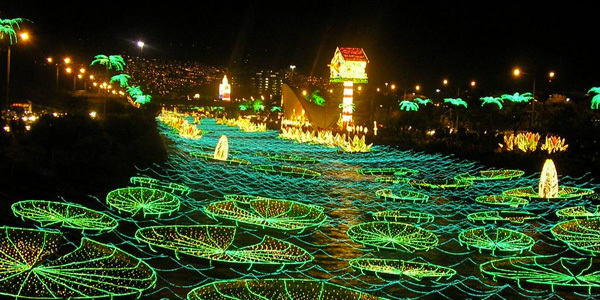 Their annual festival of lights is something else entirely. Whole streets are lit up, with buildings covered instead of simply accented. 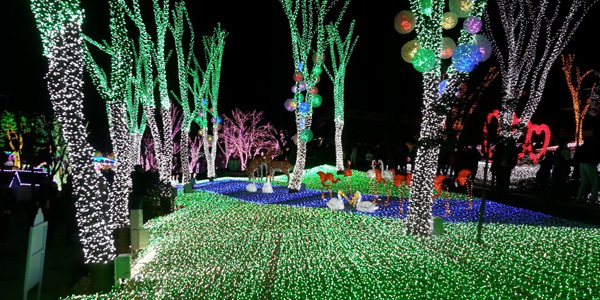 For Christmas 2016, it took 27 million bulbs and 472 miles of light hoses. Oh, and 2017 is expected to be even bigger. You got this, Colombia. Ready to get going? Great – so are we! The worst struggles we face with modern Christmas lights tend to revolve around tangling. That was one issue people didn’t face in the 1600’s when Christmas lights started to take root in Southern Germany. Way back when it was candles instead of bulbs that helped bring in the Christmas season. By the start of the 17th century, decorated trees were making an appearance across the country, and Christians would display a burning candle in their windows to indicate that other Christians were welcome to come worship. As time went by, small candles were attached to tree branches using pins or melted wax, and the early forerunner of the modern Christmas light was born. It was ‘good Queen Charlotte’, wife of ‘Mad King George’, who brought the tradition from her native Germany to the heart of England. She sat up the first known English tree at Queen’s Lodge, Windsor, in December 1800. Candles were an expensive light source, and using them for so frivolous a festive purpose became a hallmark of upper-class homes seeking to keep up with the Joneses. Candle holders replaced melted wax, and lanterns or glass balls started to be used at the turn of the 20th century. But it was Thomas Edison who really changed everything. By 1880, Edison had pretty much sussed out his revolutionary incandescent light bulbs. But how to market them? Turns out, the best way was to string incandescent bulbs all around his famous Menlo Park laboratory compound. Passing commuters would see the unexpected Christmas miracle as they passed – the remote generator was concealed a just-plain-showing-off eight miles away. Not too subtle, you might remark, but keep in mind that this is a man who once electrocuted an elephant. Two years later, an associate named Edward Johnson displayed the first electrically illuminated Christmas tree at his Manhattan home. 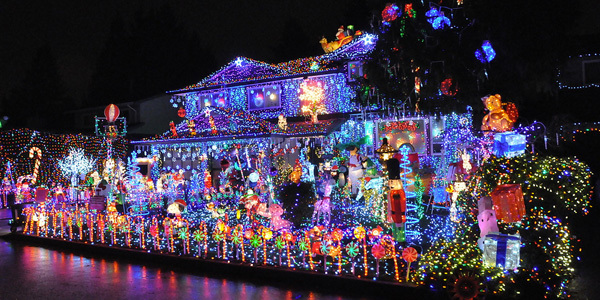 Of course, Edison didn’t quite manage to bring Christmas lights to the masses. In 1900, a single string of electric lights went for $12 – that’s $300 (roughly £225) in today’s money. Renting a generator and paying for the setup cost an eye-watering $300 – that would be $2000 (roughly £1500) in 2017. You could buy a new iPhone and still have £500 left over. So, companies went back to the drawing board. By the time the 1930s had rolled around, fears of subpar or unsafe lights were fading, and Christmas lights were affordable enough to become a middle-class staple. Demand grew, prices continued to fall, and the introduction of the minilight, which continues to dominate the market, offered high-impact, low-cost lighting. Perhaps more importantly, the way we lived began to change. With more and more families owning a home, more and more families wanted to put their own festive stamp on it when Christmas came each year, and that’s exactly what they did. What began with candles in windows across Southern Germany matured into the breath-taking illuminations that mark modern Christmastime. 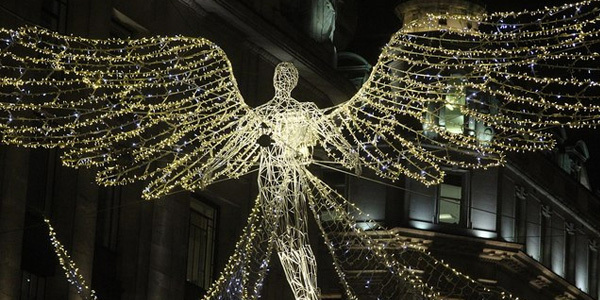 The concept of Christmas lights evolved from candles to modern LED strips, but what steps did they take along the way? We’ve already discussed how Edison broke new ground with his incandescent bulb, but it was chemist Humphry Davy who first tinkered with high-voltage arc lights. High-voltage arc light – honestly, nothing about that is remotely safe. Electricity jumped between two carbon rods to emit super-bright light. Quite impressive, but very hazardous and not at all long-lasting. Swan developed the first incandescent lights, so Edison convinced him to become a company man and then promptly developed the idea himself, gaining the rights in the process. Not exactly the Christmas spirit, but his carbon filament bulbs paved the way, so we’ll give him a pass. The NOMA (National Outfit Manufacturer’s Association) Electric Company kicked off in 1925 and remained the largest manufacturer of Christmas lights for the next four decades. Why? They developed strings of small, coloured light bulbs that were safer and more economical than anything people had seen before. Sales soared. Initial concept set in stone, inventors started to innovate. Scores of blinking-bulb patents emerged during the 1920s. When electricity created heat inside the bulb, the circuit was broken. As the light cooled, the circuit reconnected. The intermittent blinking still seen in Christmas light displays to this day was born. The same method is used in modern red-tipped blinker bulbs. First invented in 1935 by Carl Otis and then improved year-on-year, the bubble light worked by heating low-boiling liquid with a hidden incandescent bulb. Modern lights use dichloromethane instead of oil, but the design remains fundamentally unchanged. Way to go, Carl. NOMA stepped in to market tiny and easily replaceable fuses in 1951. They’re common to almost all decorative lights today, and they’re part of what makes modern lighting displays so safe and relatively dependable, especially considering the advances of smoke- and heat-detecting ornaments that followed. Even blinking incandescent bulbs soon became a little dated, and inventors answered the call to brighten up Christmas with something fresh. Blinking lights that used a small electromagnet to ring a bell when they turned back on. Bulbs that could modulate the intensity of their light based on the frequency of sounds piped into a microphone. Bulbs that used a semiconductor to create a candle-like flicker. Those 17th century Germans would have been so proud. With the rise of computers came the rise of computer-controlled lighting. It’s a concept that really gained steam in the 1990s, when fully programmable lighting systems could use state of the art software and wireless technology to produce elaborate lighting displays that changed based on what music was pumped through the sound system. Before we move to the future of Christmas lighting, why not spend some time with the Christmas lights that define the present day? The easiest way to begin is by looking at bulb types. Incandescent Christmas Lights: Generally referred to as ‘fairy lights’ or, slightly less whimsically, as ‘micro lights’. They work the old-fashioned way, by burning a filament. Bulbs are made of glass and use a very low voltage, which is one reason why they tend to be spaced so close together. They’re an established favourite often seen as the most “Christmassy” of lighting options. That said, they aren’t particularly efficient or flexible. Battery Operated Christmas Light: A popular option for exterior displays that don’t benefit from nearby sockets, battery operated Christmas lights are almost always fully waterproof and can run for weeks or months on a single set of batteries. LED Christmas Lights: The most efficient of the pack, LED Christmas lights have gained a lot of traction over the last few winters. They come in a huge variety of shapes and sizes, and the light they emit is increasingly rich and vibrant. Better yet, they’re durable enough for outdoor use, enormously efficient, and very long-lasting. Cluster Lights: Individual bulbs sit at the end of small strands coming off the main cable instead of being spaced apart along a single length. They create an effect somewhat like tinsel. Their power output isn’t too strong, but they produce a very charming look, and they’re perfect for filling out poorly-lit patches. Net Lights: Want to cover a larger area without hassle? Pick up a few net lights. These will have been strung together into set forms, so you can drape them across hedges or hang them from structures to create a uniform lighting setup without any stress, strain, or effort. Icicle Lights: Ever popular, icicle lights run several bulbs down an artificial icicle to give your home that creative winter appeal regardless of whether Christmas turns out to be white or not. More expensive varieties light each bulb in turn to create a dripping effect. Yep, Christmas lighting has sure taken some strides, and long ones at that. And it’s an industry that never stands still. With such demand each year, manufacturers are always ready and willing to adopt the latest technology, and the future of Christmas lighting seems to be LED tape. What types of LED tape are available? Why should you use LED tape for Christmas lighting? Good questions all, so let’s get started to get you up to speed. Well, LED tape is pretty easy to understand. It’s essentially a very flexible circuit board, but it looks just like a normal length of tape. What you’ll notice is the surface mounted light-emitting diodes (SMD LEDs) that run along the surface of that tape. When you connect them up to a power source, you’re provided with a long length of lit tape. There’s usually some kind of adhesive backing to help fix your LED tape where it needs to go, and it can go almost anywhere. LED tape isn’t particularly new; in fact, it has been used for years for projects as diverse as modern art installations and simple kitchen or bathroom accent lighting. But now it’s set to conquer Christmas. LED tape might be new to the Christmas light market, but there’s already a smorgasbord of different types, with options covering everything from colour warmth to LED chip number. Let’s start with chip number. You’re basically going to find two chip types on the LED tape market: the 3528 and the 5050. Each comes with its own power requirements and output brightness, and the best choice depends on what you need your LED tape for. The 3528 LED Chip: Smaller than the 5050, the 3528 is usually found on 12-volt LED strips that draw 4.8 watts and output around 330-360 lumens per metre – the exact number will vary depending on your chosen colour. A range of colours are available, and 3528 bulbs produce a smooth, bright effect. They don’t give off much heat, and they’re ideal for interior feature lighting. The 5050 LED Chip: The larger brother to the 3528, your 5050 LED bulb can house four separate LED chips, which is why they’re sometimes called ‘quad LEDs’. Modern cars often boast ‘quad LED headlights’ to denote superior visibility, and tape follows suit. Offering around 990 to 1080 lumens per metre, they’re a faultless choice when you require brighter lighting. They’re also wonderful for colour-changing since different colours can be housed in the same bulb. To find out more check out this helpful post of LED Chips to find out which one you should choose. Length: LED tape can be cut to size, so take your measurements before you go shopping. And beyond simple length, factor in the concentration of LEDs. Cheaper tapes use the lowest number possible – veer clear of them and look for the highest number of LEDs per foot. If you don’t, light will be spotty and less attractive. Brightness: LED advances have improved the output of each diode, but that doesn’t make all LED tapes equal. Brightness will always be measured in lumens, but the higher number isn’t always the best one. For accent lighting, try staying below 200 lumens per foot. For outdoor use, look for a higher number. Colour: There’s a range of colours available, and LED tape made for Yuletide decorations naturally offers a wealth of options. The most basic emit a single colour, but you can also pick up colour-changing strips. These are known as RGB strips – you can use a controller to adjust how they change or simply keep them in one solid colour. Colour Temperature: People know to consider colour closely, but few account for colour temperature. LED light can appear ‘warm’ or ‘cool’ – in general, cooler colours take on a blueish hue while warmer ones look yellower, just as you’d expect from a traditional incandescent. Temperature is measured in kelvins. For warm, look between 2700K and 3500K. For neutral, look between 4000K and 6000K. For cool, look above 6500+K. Yes, it might seem nonsensical for cooler colours to use higher temperatures, but that’s just the way LEDs roll. You can run AC LED tapes straight from the socket, only having to plug them in to have them ready to go, or you can choose DC LED tapes for a waterproof silicone covering and the convenience of adhesive backing. Looking for lumens aplenty? High power LED tape is also available, although it’s often a little more rigid than your typical tape, so take that into account before you buy. Why is LED Tape the Future? Maybe you’re a little flummoxed by the number of factors you can consider when it comes to LED tape. Truth be told, it isn’t nearly as complicated as it seems – all you’ll normally need do is navigate to the right section of a website or area of a shop, and there’s a compelling range of benefits to adopting LED tape for Christmas 2017 and beyond. Cut to Length: An LED strip can be cut every few inches without causing any damage, opening up plenty of options to fully design your Christmas project for a bespoke finish. You can even cut it yourself – no expertise required! Flexibility: LED tape can be bent back upon itself vertically up to 90 degrees, so you can deck the halls from top to bottom and work your lights around tight corners. Colour Options: You’ll have the freedom to choose from a comprehensive selection of single colours and colour changing options. Low Profile: Though capable of producing plenty of light, the tape itself is remarkably inconspicuous. Thickness is usually around 2mm, so the tape can be easily hidden from view and worked into tight spaces. Complete Protection: Environmental protection can be added to resist anything from water to dust. Minimal Heat Output: Even after long hours of use, LED tape will remain cool to the touch. Portability: LED tape can be powered from a USB device or battery pack, so there’s no need to run extension cables out from your garage. We could go on. Suffice to say, LED tape is the cat’s pyjamas. You get flexibility, eco-friendliness, versatility, safety, and long service life all in one single package – let’s just say LED tape has firmly earned its place on Santa’s nice list.